The Presidential Brass Pillars Tower Desk Clock with Sand Timer is crafted out of mahogany-stained hardwood with solid brass and features an elegant timepiece and a 7 minute, inter-connected sand timer. A handsome display piece for any setting, it makes an excellent retirement, employee service award, wedding, birthday or anniversary gift. Measures 10" x 6 3/4" x 4 3/4" in dimension. You can find that perfect recognition employee executive business clock gift. 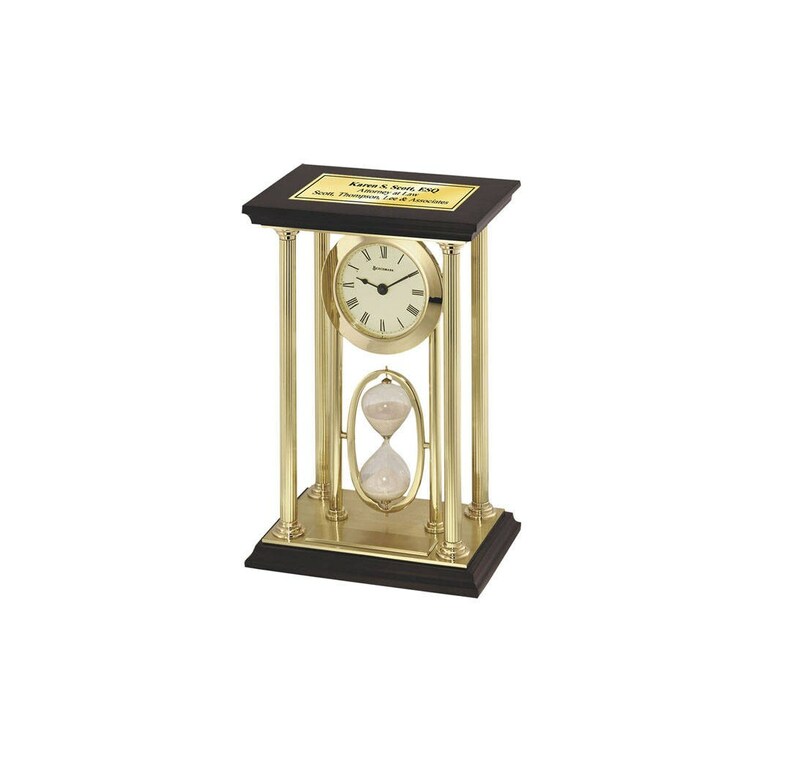 ♥ The Presidential Brass Pillars Tower Desk Clock with Sand Timer is crafted out of mahogany-stained hardwood with solid brass and features an elegant timepiece and a 7 minute, inter-connected sand timer. Personalized corporate recognition and employee retirement desk clock and service award clock provide the recognized employee with everything they need to motivate and succeed in the workplace. Every personalized award desk clock product we manufacture and sell are filled with distinction and imagination. Employee Recognition Executive Clock Award with Gold Engraving Plate Online promotional products Anniversary Desk Clock Retirement Coworker Boss Colleague Table Clock. We sell promotional items and corporate logo awards. Awards & Recognition.Personalized wood desk clock with silver engraving plate. Congratulation engraved desk clock with distinction. This beautiful engrave desk clock makes a unique retirement, employee recognition, wedding, anniversary or graduation gift present. A unique table desk clock gift idea for coworker, employee, boss, girlfriend, boyfriend, wife, husband, etc.... Personalized clock gifts by Framing Achievement, Inc. creation. Rating high on style and elegance, Framing Achievement's personalized poem photo gifts are the first choice in premium poetry presents for Anniversary, Birthdays, Weddings, Retirement, Graduation and many more occasions. Unique Anniversary Wedding Gift, Corporate Business Employee Service Retirement Appreciation Award and Birthday Graduation Gift. From appreciation award to unique custom corporate logo glass desk clock, we have a variety of wood anniversary clock awards with free engraving. Find anniversary clock gifts, personalized wedding clocks and employee service awards. Find executive gifts, personalized clocks and employee service awards at our clock store. In addition to corporate awards program, we have a variety of personalized clock gifts. Our products are excellent wedding anniversary gifts with free engraving and etching. buy a wedding desk table clock for the groom and brige as wedding gifts. Personalized wood desk clock with silver engraving plate. Congratulation engraved desk clock with distinction. Let our personalized engraved desk clock gift products imagination wander and explore the possibilities that you can create with a custom sentimental meaningful message in our elegant clock gifts. A unique table desk clock gift idea for coworker, employee, boss, girlfriend, boyfriend, wife, husband, etc.... Personalized clock gifts by Framing Achievement, Inc. creation. Rating high on style and elegance, Framing Achievement's personalized clock gifts are the first choice in premium presents for Anniversary, Birthdays, Weddings, Retirement, Graduation and many more occasions. Unique Anniversary Wedding Gift, Corporate Business Employee Service Retirement Appreciation Award and Birthday Graduation Gift.